For investor's looking for compelling value, rubber stocks might just be the place to look. Times have been tough for rubber stocks, including rubber industry leader Goodyear Tire & Rubber (NASDAQ:GT), as of late. However, rubber stocks have one thing going for them: they're quite impervious to disruption. Electric cars may disrupt the automobile industry, but they'll still have to run on tires (which are made mostly of rubber). This of course goes hand in hand with a lack of astronomical growth. All this being said, this doesn't mean that rubber stocks are poor investments. Quite the contrary, in fact. The rubber industry today is mature and fairly concentrated; the top dogs -- Bridgestone, Michelin, and Goodyear -- together account for about 60% of the market. For this reason, wild gains or losses in market share are unlikely. With this key insight in mind, let's dive into the top buys in the rubber industry today. 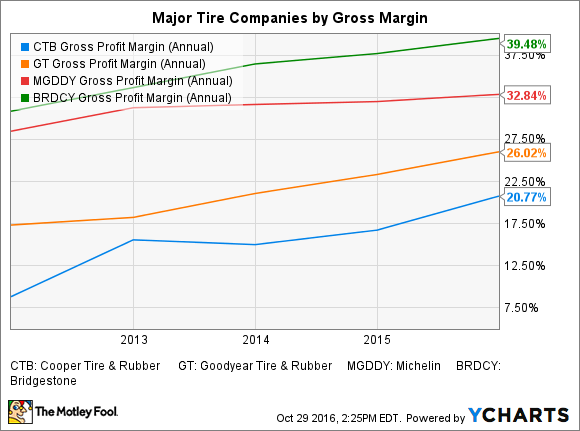 Cooper Tire (NYSE:CTB) is one of the little guys, with about a 5% market share in North America. Generally speaking, the smaller you are in this business, the more you have to compete on price; it's usually the big guys that sell the high-performance replacement tires with fat margins. There are some exceptions to this rule -- namely, Pirelli and Continental AG (which is barely a little guy) -- but generally this is how it is. Despite all this, and despite the fact that it has no original equipment manufacturer (OEM) business to speak of, Cooper is a worthy competitor. It makes good products at good prices, and its truck tires are considered superb. Best of all, it's selling at a very reasonable price of just under 10 times last year's earnings. With only $300 million in debt and $400 million in cash, its balance sheet is very strong. One thing to watch out for is whether it can expand in China. You may have heard a while back about its CCT joint venture which ended up derailing a very possible merger with the Indian manufacturer Apollo Tyres. That joint venture ended with CCT buying out the Cooper stake. But Cooper is back with another joint venture, this time with a certain GRT (Qingdao Ge Rui Da Rubber). Let's hope they get it right this time. When you're an active investor, it's important to be always looking, and I'm kicking myself for missing Titan International (NYSE:TWI) when it sold for less than three dollars a share back in January. Now the stock is at $10 (a three-bagger in less than a year! ), and the value proposition is not what it once was. Unlike Cooper, Titan is not a tiremaker for cars but rather for the big machines that you find in the agricultural, earthmoving, and construction industries. Therefore it's subject to very different conditions from those faced by a Cooper, which is basically an auto parts maker. Titan's customers are OEMs like Deere, Caterpillar, and AGCO, and if you haven't heard already, the agriculture and mining sectors are in a major cyclical rut. The business of Titan was low margin to start with, and the last two years have been even worse with operating losses and impairments. The good news, however, is that in its field, Titan has commanding market share. It owns 75% of the market in off-the-road (OTR) wheels (it makes wheels and undercarriages as well as tires) and 40% of the market in OTR tires. If you're long-term bullish about farming and farming equipment, especially in emerging markets, then Titan is worth a hard look. In terms of financial strength, it has about $300 million in net debt and did about $45 million last year in EBITDA and $64 million in operating cash. It's not ideal, but I think the company will survive. In his best-selling book, The Innovator's Dilemma, Clayton Christensen distinguishes between sustaining innovations and disruptive innovations. A disruptive innovation creates a new market and a new value network, while sustaining innovations improve on existing capabilities. In the rubber/tire industry, the one and only disruptive innovation was synthetic rubber. Everything else, including online sales, has been basically sustaining. All in all, this is good news for tire-makers, as it decreases the likelihood of their product becoming suddenly obsolete. Unless the vehicle of the future is a wheelless one, tire companies aren't going away anytime soon.